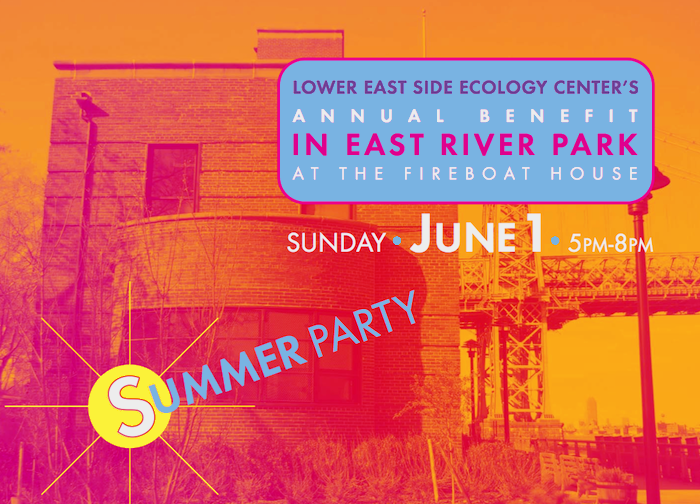 The Lower East Side Ecology Center is having their annual Summer Party on June 1, 5 pm – 8 pm, right across the highway at the East River Fireboat House. LESEC hosts e-waste recycling events all over the city, promotes composting and energy efficiency, and helps to maintain our big green neighbor, the East River Park. It’s a family event, children under 12 are free. For adults, tickets are $60 in advance or $75 at the door. 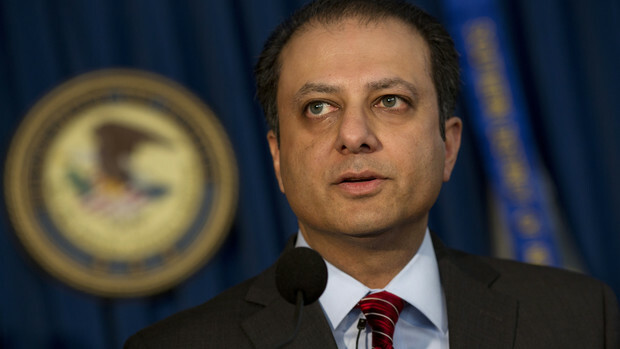 Apparently the complaint “United States of America v East River Housing Corp” we distributed on Wednesday and posted to this website yesterday was not the most recent version. The complaint was amended in January to include two more complainants — two more cooperators whose requests to keep pets in the co-op were denied. 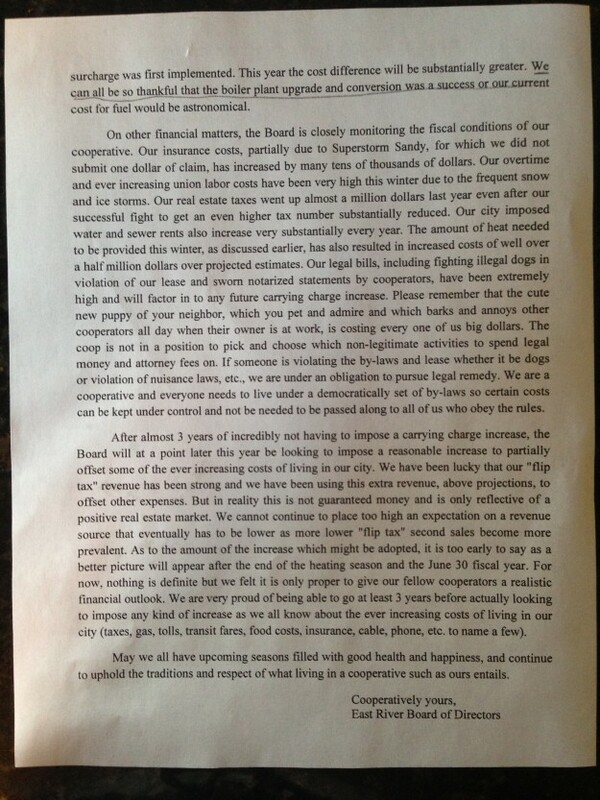 The amended complaint can be read here. For reference, here’s the memo the board sent all shareholders on March 17. The fuel surcharge has been added permanently to our monthly carrying charges, and a further increase is hinted at, with some explanation of how expenses are increasing. Two more charts to add to Sunday’s rudimentary look at co-op finances. I wanted to look at how the proportion of income and spending segments have changed over time. If inflation were the only driving force in increased expenses, for example, all the lines below would be flat. Where that is not the case, we may consider that there are other factors at work. 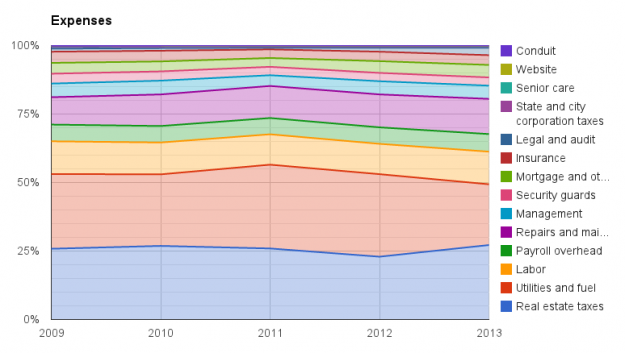 This is what the change in relative revenue looks like over the past five years. You can see that even though carrying charges have increased absolutely over those five years, they have decreased as a proportion of overall co-op income; that is, they have not increased at the same rate as other sources of income. Resale fees have increased in importance as the real estate market has heated up. Everything else has remained relatively consistent. Here you’ll see that taxes have fluctuated slightly but stayed around 25% of overall expenses; utilities and fuel costs have noticeably decreased (though before this past winter); maintenance costs and legal fees have both increased relative to other expenses over the past 5 years, but just barely. Everything else has stayed pretty consistent. The financial reports distributed each year before the annual shareholders’ meetings do give a good skeletal look at co-op finances. And it’s worth having a basic understanding of our income and expenses to gauge the impact of, for example, a very cold winter, on the one hand, and an increase in carrying charges, on the other. Where do we get our income? The #1 source of income, by a wide margin, is monthly carrying charges (maintenance). 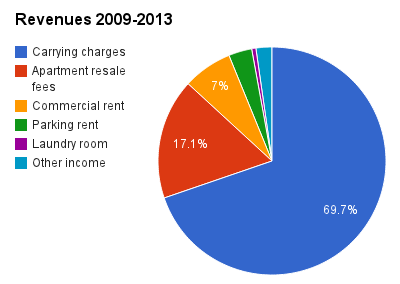 Apartment resale fees (the flip tax) account for another large chunk. Everything else adds up to only a bit more than 13% of revenue. 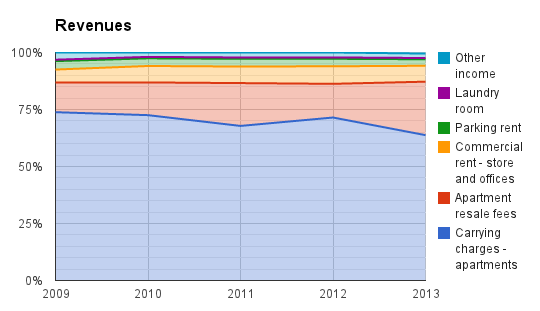 How has income changed in the past 5 years? Revenue categories have stayed relatively stable, with apartment resale fees fluctuating slightly based on the real estate market. In 2013, flip tax intake jumped 75% over 2012 — $2.3 million — as apartments returned to the recovering market. 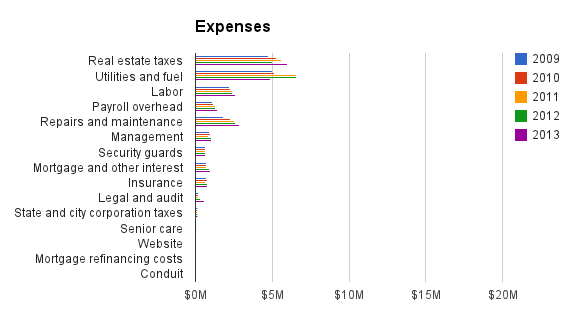 How have expenses changed in the past 5 years? Here we can see a bit more variety from year to year. 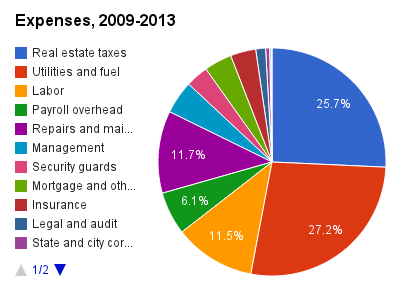 Taxes have increased 26.7% ($1.27 million) over five years. Fuel costs vary by $1.7 million from low to high, and that does not yet include this past winter’s fuel bill. 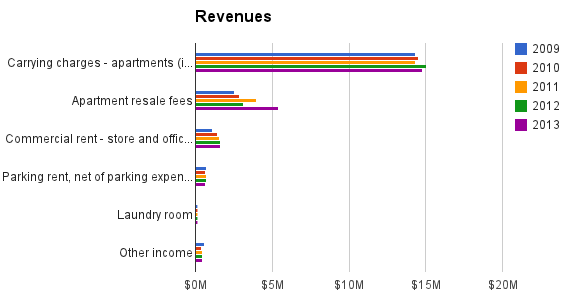 Other expenses show a consistent trend upward by small margins. Primarily, outside forces: taxes, fuel costs, and inflation (though most of the gradual increases above are all greater than inflation in the same period of time). There’s probably a limit to what can be done to keep these expenses down. 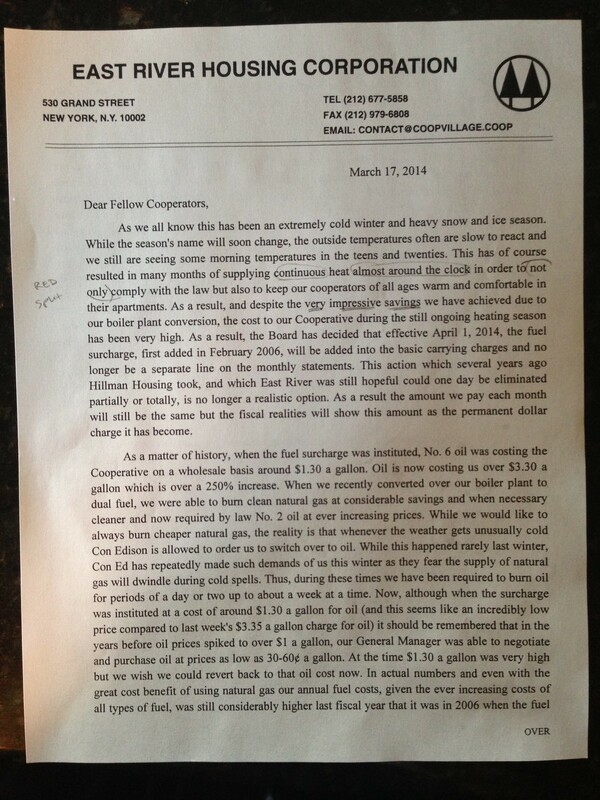 The co-op management has no control over real estate taxes, fuel costs, or weather. Labor costs should be expected to increase each year, by a reasonable amount. It’s possible that costs of repairs and maintenance could be controlled, or that the jump in legal fees could be mitigated. But, as the chart above shows, any savings in these areas would have a small effect on the overall budget. What will income look like in the future? Flip tax income should tend to gradually decline as 1st-time sales decrease and more sales pay lower fees. If the real estate market continues to grow, flip taxes will follow suit, but still at less than the market rate because of the decreasing number of 1st-time sales. Flip tax revenue is likely to decline as a percentage of co-op income over the long run. Carrying charges and parking fees remain flat unless explicitly raised by the board. Rents are, for the most part, locked in to long-term leases, but a full evaluation of all co-op stores, offices, and communal areas could reveal small opportunities for extra income. What if taxes increased another $1.25 million in the next five years? What could the co-op do to raise revenues to match? Well, a maintenance increase of about 1.5% each year would cover that increase. Or parking rates could be raised by 38% each year. Laundry rates could triple every year — so that by 2019 a load in the washer plus 30 minutes in the dryer would cost you $26. Any of these methods would raise the same amount of money from shareholders. Which makes the most sense? There are a lot of details I don’t have access to, and others I’m glossing over. But I hope this helps understand the scale of the co-op’s budget — currently at $23 million — and the kinds of choices available to the board, management, and shareholders.